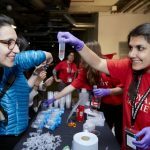 Many of you may be interested to see the Royal Society have just launched a series of public engagement training workshops over the next year. A course for those with some experience that will demonstrate how to create research-led projects that meet engagement aims. A course for those scientists with some experience that will enable researchers to create effective engagement projects in schools.